...is all around us. I am in love. I am madly in love. I have found the love of my life. He makes me so happy and excited every time I see him. This great love inspired me to buy a romance novel after a TWO year hiatus. My love's name is socks. I am in love with socks. 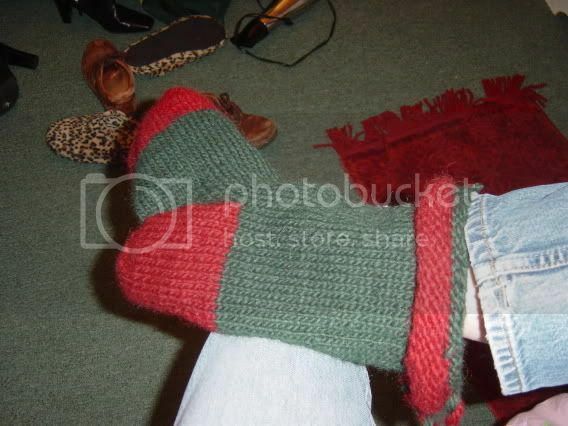 I finished my Christmas Stocking on Friday night and cast on a sock on Saturday. The picture doesn't look that impressive, because this my fourth attempt at my socks. First Try: I tried two circular needles. After knitting a row or two, I got frustrated at trying to figure out which needle to pick up. If I try it again, I will have to buy circular needles that are different colors. I hated having to deal with the four needles, the cast on yarn, and the active yarn. I will have to try the two circular needle technique at a later date with better materials. Second Try: I cast on for a sock from Nancy Bush's Folk Socks. I like the sock, but I am concerned that my gauge isn't right. I decided to put this sock on the back burner for the moment. Third Try: I cast on and knit the cuff for the men's large sock instead of the women's medium. I can understand why some people just knit socks or knit socks all the time. When I first cast on, I get all excited that I am starting a sock. Look at me! I am knitting a sock! How cool am I?! 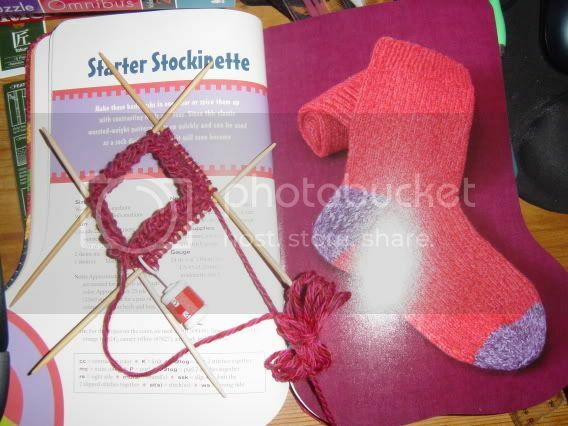 By the time the excitement wears down I am knitting the heel and the gusset. By then I am thinking about how exciting it is that I am almost halfway done. Look at me! I am turning the heel! I am picking up stitches! I am Queen of the World! At this point, I am tired of the excitment and need some monotonous knitting. Lucky for me, this is when I get to the foot and there is little thinking for the moment. After I am tired of the monotonous knitting, I get to the toe and then I am done! It is awesome. Plus, socks are easy to transport! ::sigh:: I am in love. Even though my Christmas Stocking is not sized to wear, I had to dance around my room in it to celebrate the making of my first sock-like object! Yeah, this is the reason I decided to oversleep. 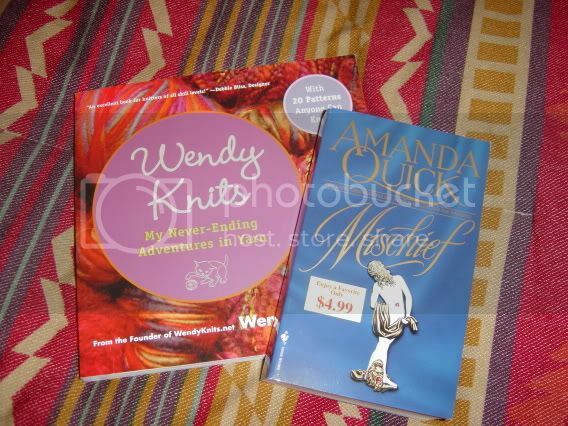 I was very proud of myself for my "self-control"
so I allowed myself to get Wendy Knits and a romance novel at Borders. The stipulation was that I had to walk to the Providence Place Mall and not use my car. This, this I could do. I also got caught up my email. Sorry for those of you who were waiting for responses! I have been lazy for the past couple of days. I didn't just sleep this weekend. I started washing my knitted goods. Isn't that lovely? I should have known when the water was colored that the hat would stain the bed, but did I think? Nope. 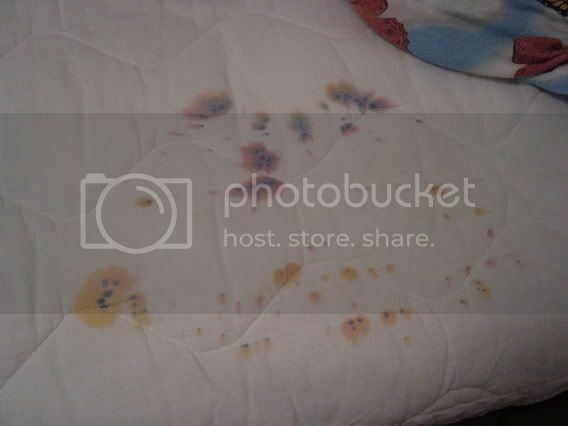 At least, I just stained the mattress pad and not the mattress itself. Note to self: Buy a couple of towels just for washing knitted goods. Hooray for stockings! Turning the heel is strangely riveting...I think it's the slipped stitches.